In recent years, we've seen various versions – usually homespun such as this by 250 Beers – of craft beer calendars. The idea is that each day you open a box / drawer / door and inside is a tasty beer for you to enjoy as you countdown the days to Christmas. Now, continuing to plough their furrow as Australia's innovative packagers nonpareil, Bridge Road has gone and done it with real style. 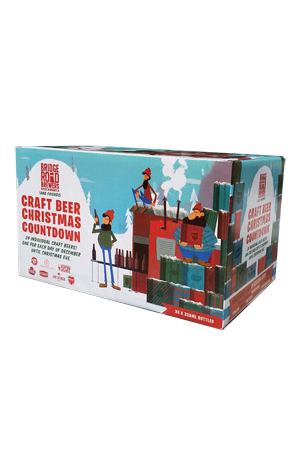 They've put together the Craft Beer Christmas Countdown: a properly packaged and suitably colourfully decorated carton of 24 Australian craft beers. And, in the spirit of craft beer and Christmas, they've put aside any selfish desires in order to share the love. Half of the beers in the pack come from Bridge Road but the remaining 12 are made up of beers from seven of the brewery's friends from around Australia: Van Dieman, Moon Dog, Fortitude, Murray's, Hargreaves Hill, Feral and Mountain Goat. Anyone that picks up (or is gifted) a pack won't know what beer is coming on each day until they open it, which they do in traditional advent calendar stylee via individual perforations in the pack's lid. Packs will start appearing at Dan Murphy's across the country from the middle of November or can be purchased direct from Bridge Road Brewers. NB: The brewery was kind enough to send a case to Crafty Towers. However, we've been overcome by the spirit of generosity and have decided (with brewery owner Ben's blessing) to give it away to a reader of our weekly newsletter. We'll run the competition on November 6 so sign up before then if you'd like to be in with a chance of winning it.